Luxury Lean is yet another bogus diet pill which does not work. That is the reason they are promoting it through deceptive free trial offer which is nothing but scam. You might seen the above advertisement while browsing for some diet pills online. Some people have received SPAM emails enticing them to try this sample offer. However, let me warn you once again… Luxurylean is scam. It is neither a free or sample offer. To get sample bottle you must pay $4.95 shipping charges. Once they have collected your credit card number, they fraudulently enroll into auto-shipment program. You must cancel the order within 14 days, else you’ll be sent another bottle for $89.95. Cancelling your order is not as easy as placing order. They make it almost impossible to cancel recurring charges. The fourteen (14) day trial offer for Product includes enrollment in our recurring shipping program, which is subject to the terms described below. The fourteen (14) day trial period starts two (2) days after the date that you place your order. This two (2) day period allows for transit time, which may take an estimated two (2) to five (5) business days. However, we do not guarantee arrival dates or time. When you place your order, we will charge the nonrefundable subscription fee, which includes shipping and handling, of $89.95 USD to the card you provide at checkout. The top of the order receipt enclosed with your shipment will state the end of the trial period. You must contact customer service at least one (1) business day before the end of the fourteen (14) day trial period to cancel and make arrangements to return the trial supply to avoid paying for the trial supply and continuing in our recurring shipping program. See customer service contact information below. If you do not contact customer service to cancel at least one (1) business day before the end of the fourteen (14) day trial period, we will charge $89.95 USD, which includes shipping and handling, the day after the trial period ends to the card you provided at checkout and you will continue with the recurring shipping program. Approximately every thirty (30) days after the trial period (“Subscription Term”), we will automatically charge $89.95 USD to the same card you provided when you signed up for the trial offer. Please note that we calculate the fourteen (14) day trial period and Subscription Term in calendar days (Monday thru Sunday), not business days. Unless you cancel at least one (1) business day before the end of the trial period or Subscription Term, our recurring shipping program will ship you a fresh thirty (30) day supply of the Product two (2) days after you place your trial order and approximately every thirty (30) days thereafter. You may cancel your enrollment in the recurring shipping program at least one (1) business day before the expiration of the trial period or Subscription Term by contacting customer service. See customer service contact information below. It is dummy and useless weight loss supplement which contains ‘forskolin’ which is extracted from ‘Indian Coleus’. It is used in some ancient Ayurvedic medicines and has minor health benefits. The only good thing about this ingredients is that it does not cause any dangerous side effects. If you are trying to lose weight then don’t expect any major benefit! Is Luxury Lean a Scam? Yes, yes yes…It is scam because massive financial fraud. Genuine diet pill producers don’t promote products through fake customer reviews and fraudulent free trial offer. 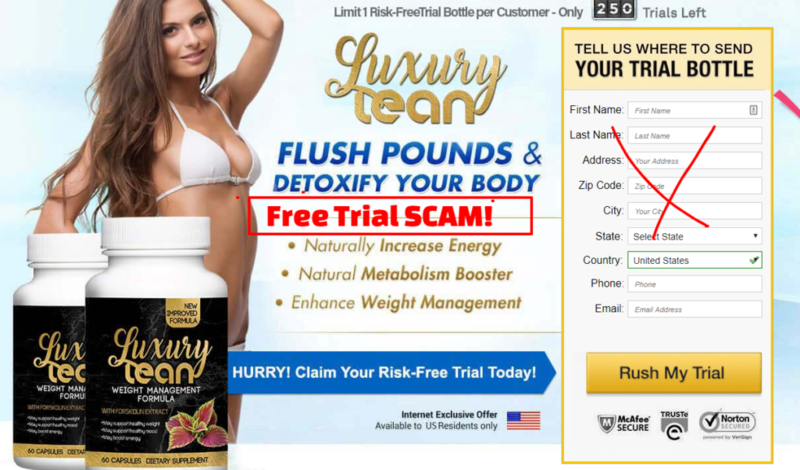 Check out our best fat burner here [top 10 list] This scam is similar to Dietspotlight Burn TS which I have already reviewed.